Looking for a reliable lawn service provider? Mike's Mowing provides reliable & professional service at a competitive price. blowing all grass clippings off of walkways and out of gardens/flower beds. bagging (and hauling) of all grass clippings. We ensure a quality cut by using sharp blades, alternating the mowing pattern to reduce soil compaction, and cutting your lawn at a height appropriate for your grass type & soil conditions. Limited space available for weekly lawn mowing. Sign up now to ensure you are on the 2018 mowing list! . * Contact us today for details or use the form on the right. We can provide weekly lawn mowing service in all areas of Kamloops. In addition to weekly lawn care, we can provide short term lawn maintenance for people who will be out of town for an extended period. Give us a call before your summer vacation! To ensure a healthy lawn it is often necessary to aerate the lawn. Aerating or Core Aeration is the process of removing small plugs of soil & thatch using an aerating machine. Removing these cores reduces soil compaction and helps break up the thatch layer so that water, air and nutrients can reach the root system. A healthy deep root system is essential in the hot & dry climate of Kamloops. Compacted soil with a thick thatch layer will cause roots to grow closer to the surface making them susceptible to drought. We recommend aerating your lawn once a year, either in the early spring or fall. 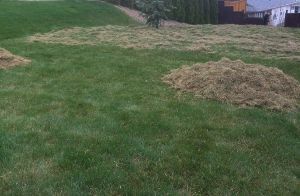 Dethatching or Power Raking your lawn is the process of removing excess thatch and debris using a power raking machine. Excessive thatch and debris can prevent water and nutrients from reaching the root system. While the two terms are often interchangeable, there is a difference. Dethatching is a more aggressive process for extremely thick thatch layers while Power Raking is much less aggressive. In simple terms, Dethatching can be described as ripping through the thatch layer, while Power Raking is more like combing the thatch layer. If your lawn feels very spongy (indicating a thick layer of thatch) the aggressive Dethatching process may be necessary, however for most lawns the less aggressive Power Raking method is sufficient. In addition to lawn mowing, aerating and power raking we can also fertilize your lawn to ensure that your lawn is receiving the nutrients necessary for a healthy lawn. We use high quality lawn fertizer to ensure even feeding with long lasting results and no "burning." We recommend fertilizing your lawn in the early spring, late spring and early fall.